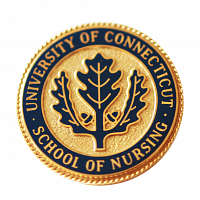 In 1955, The University of Connecticut School of Nursing chartered Mu Chapter, the 11th chapter of Sigma Theta Tau International, the Honor Society of Nursing. There are now over 400 chapters internationally, with 120,000 active members in 90 countries. Undergraduate and graduate students who meet requirements are invited to join. Sigma Theta Tau International encourages scholarship and research in nursing. Local meetings are held during the year to encourage nurses to share their research with their colleagues. Mu chapter sends representatives to the annual regional, national and international conferences of Sigma Theta Tau international. In addition, outstanding research proposals are funded by monetary awards from the Mu Chapter and by Sigma Theta Tau International. The Sigma Theta Tau key is the symbol of scholarship. The cup denotes the satisfaction of professional life. The circle of gold with its six stars represents our six founders. The letters SQT – Sigma Theta Tau – represent our charge: Storga, Tharos, Tima – love, courage, and honor. The lamp is the lamp of knowledge. The jeweled key features amethyst stars representing the founders in a circle of pearls or diamonds. The organization’s colors are orchid and fuschia, and the flower is the orchid. The symbolism of the coat-of-arms is expressive of the ideals of Honor Society. The eye represents wisdom and discernment. The stars are in recognition of our six founders. The scroll is that of learning and bears the Greek letters, Sigma Theta Tau: the first letters of the Greek words Storga, Tharos, Tima- meaning love, courage, honor. The pillars of stone at the right and the left denote service, professional endeavor and strength of leadership. The lamp represents the lamp of knowledge. The motto on the banner is Sigma Theta Tau, the name of this International Honor Society. Please read below to see the eligibility criteria for undergraduate students, RN students, Master’s students, Doctoral students and Nursing Professionals/Community Leaders. For previously inducted members now at other institutions, Dual Membership will allow continued connection with Mu Chapter. All Mu Chapter members are eligible to apply for an award of up to $1,000 to support research/clinical practice projects. Applications will be accepted on a rolling basis and evaluated 3 times per year (June 5, September 5, January 5). Up to 6 awards will be given annually. Rank in the upper 35 percentile of graduating class. Have a GPA of a least 3.5 (based on 4.0 grading scale). Have a GPA of a least 3.75 (based on 4.0 grading scale). Demonstrated marked achievement in nursing education, practice, research, administration, or publication. Includes: Knowledgebases, the Online Journal of Knowledge Synthesis in Nursing, and the Registry of Nursing Research, which includes both published and unpublished nursing research (Sigma Membership Number is needed for entry).